Home renovations are the simplest way to transform a house that you generally love into a home you will treasure forever. There are multiple ways to go about your timeless renovation but the one thing that remains the same is the need for a insured and top-notch contractor to do the work for you. 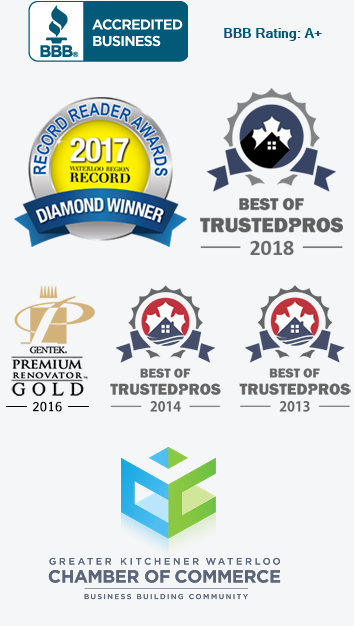 Westmount Craftsmen is committed to providing unique, full-service house renovations in Kitchener and Waterloo. We make sure your household’s tastes and lifestyle are at the forefront of our design process. We understand your home is one of the most important investments you’ll make. With the right vision, it can adapt to all of life’s changes. Our goal at Westmount Craftsmen is to facilitate a final design that accommodates these changes so you always have a home that looks, feels and functions the way you want it to. Our team puts significant time into getting to know your family. We listen to what you have to say so our final product is as much about your wants and needs as it is about our professional input and final construction plans. Whether you require a single bathroom renovation, a minor addition or are ready to completely redesign the interior of your home, our commitment to high-quality construction and superior customer service will yield a design that increases your home’s value for decades to come. Ready to experience the most worry-free Home Renovation process possible? Working with Westmount Craftsmen guarantees your home remodeling will be executed in a professional, timely and cost-effective manner. You will always feel like you’re part of the process, which makes for a worry-free experience. Here is a little bit about how we work to make a house renovation enjoyable – yes, enjoyable! The key is communication. We have adopted a multi-step approach that prioritizes communication with you from the get-go. The first time we sit down, we‘ll take a look at your home’s interior while you tell us what you are happy with and what you aren’t. Are you ready to bring your 1960’s home into the current era? Do you wish your home had a bit more of an updated yet traditional feel? Perhaps you’re ready to open up your space or the main floor renovation you’ve always wanted. This is the time to get it all on paper so we can brainstorm a design that involves your most pertinent wants and needs, while simultaneously maintaining a vision for how your home will evolve in the future. The following are some of the most typical projects our client’s are looking for. However, we look forward to any ideas you have when it comes to the house of your dreams. The main floor of your home is what you and your guests see first. Open, spacious and relaxed floor plans are not difficult to create in decades-old floor plans. We can help you design a living room, family room, kitchen, dining room and bathrooms that are visually stunning while still making your family and guests feel right at home. Wish you could take a magic eraser and draw your entire interior over again from scratch? Now, you can! You would be amazed what our team can accomplish. We can add, remove and relocate walls, get rid of space consuming bulkheads or expand your living space so it finally reflects who you are and the life you live. Sometimes, there’s simply nowhere to go but upward or outward. Home additions are a great way to add space and value to your home. We can add a second-story onto your older bungalow, extend the kitchen so you have room for perimeter counters and a kitchen island or knock out a wall in a bathroom to accommodate your new luxurious whirlpool bathtub. Sometimes more really is more. What used to be simply a utilitarian space – The Laundry Room – is now more important then ever. We create a laundry rooms that keep winter and extra-curricular clutter out of your main areas and inside an organized, efficient and attractive workspace. Dated fireplaces detract from the rest of your home’s design. Let’s create a fireplace area that truly serves as the “heart of the home.” We can even include innovative ways to hide your TV and electronics so you only see them when they’re in use. Don’t have an attractive deck space? From beautiful entertaining space, thoughtful patio covers and privacy breaks, you can look at the stars from season to season with the right re-design of your outdoor spaces. We use the highest-quality materials, including beautiful composites, cedar and pressure-treated woods as well as glass and aluminum railings. We never cease to be amazed at how vulnerable our client’s houses are to water damage and all of the ensuing issues that come along with it. We can go through room to room to make sure your home is sufficiently sealed and protected. This includes attics and basements, bathrooms and laundry rooms as well as typical leak points like your windows, doors and chimneys. Give us a call at (519) 635-7089 or fill out the form below to schedule your consultation so we can begin discussing your dreams and plans. We know you’re excited about all of the possibilities and we look forward to making them a reality.